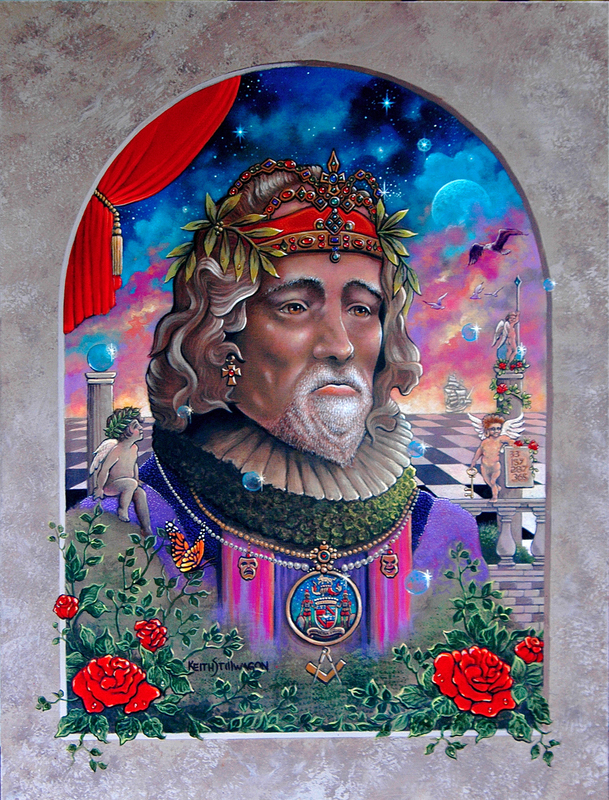 On October 14, 2007 Keith Stillwagon, popular artist of Gulfport, Florida unveiled his latest painting, "Tudor, Bacon, Shakespeare. "Commissioned on June 6th by an anonymous source, the painting is being dedicated to Lawrence Gerald, creator of the Baconian website www.sirbacon.org in celebration of the website's recent Ten Year Anniversary on October 10th. The painting honors the memory of the great Sir Francis Bacon and proclaims the theory that Bacon was born a Tudor Prince to Queen Elizabeth I by placing a Tudor crown upon his head. Furthermore, Keith has incorporated symbols in the painting that hint at Bacon's authorship of the Shakepeare works. The mystery of who wrote Shakespeare becomes less cloudy when it is considered that Elizabeth's high intelligence was genetically passed down to Bacon who was raised with an extensive education and has been the strongest candidate for the authorship since the controversy began. The three-in-one portrait of Bacon is now immortalized in Keith Stillwagon's painting ; "Fair" represents the name Tudor, as the theory goes Bacon was born in secret to Queen Elizabeth I and Robert Dudley; "Kind" represents the beautiful words of William Shakespeare, Bacon's pen-name; and "True" represents Bacon in his public and known personality and who began his famous essays with "Of Truth."